"For people to think that these authorities should be independent, that's not the case." For once, the turmoil at the Port Authority wasn't over massive transit cuts and layoffs. Only one person was set to lose his job on Feb. 1: CEO Steve Bland. Ultimately, five board members voted, at the behest of Allegheny County Executive Rich Fitzgerald, to terminate Bland "without cause." That designation means Bland exits with a severance package worth $92,500. Three board members voted against the firing, arguing it was a political maneuver to unfairly remove a capable leader. "I've received nothing to demonstrate that Steve's imperfections warrant termination without hearing," board member and County Councilor Amanda Green Hawkins said before the vote. "What I have witnessed has been a concerted and methodical effort to get rid of Steve." Bland's departure wasn't the end of the shake-up. In a narrowly divided vote, board chair Jack Brooks — a Bland backer — was replaced with a Fitzgerald ally, Jeff Letwin. The rest of the board's leadership positions were also turned over to Fitzgerald appointees: Thomas Donatelli, John Tague and Constance Parker. All had voted for Bland's ouster. 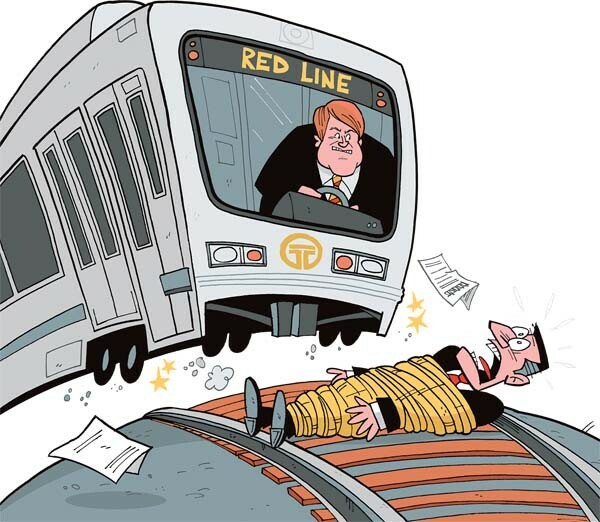 Those moves place Fitzgerald firmly in the driver's seat at the transit agency. And at a press conference held hours after Bland's removal, Fitzgerald made clear that that he intended to keep his hands on the wheel. "I, as the elected county executive, and county council as elected council — we set policy," he told reporters. And while Fitzgerald said he appointed authority members with technical expertise "who can give good, solid advice," he added, "The policy and direction of the agency is going to be set by my administration ... and by county council. "So for people to think that these authorities should be independent, that's not the case." Some board members aren't happy with such oversight. "The problem with Mr. Bland is he's an administrator and not a politician. That doesn't work in this town, evidently," Brooks told reporters after Bland's firing and his own removal as board chair. "Fitzgerald got what he wanted." Bland's departure might have been a change that Fitzgerald has wanted for some time. Tensions with the county executive bubbled up for the first time, at least publicly, last May, when a weekend shortage of operators caused massive light-rail delays on the newly launched North Shore Connector during the Pittsburgh Marathon, a Pirates game and a Stage AE concert. Fitzgerald said that his office heard the outcry from constituents. "People were losing confidence in that system," Fitzgerald said. "They didn't call the nine board members. ... The calls came to me." And that, Fitzgerald says, is why he wants a hand in how county agencies operate. Among other criticisms of Bland: a "disconnect" between management and workers; broken-down contract talks with Amalgamated Transit Union Local 85, into which Fitzgerald inserted himself; and Bland's resistance to Fitzgerald's ideas, like converting the fleet to natural gas, posting better signage around town, changing the flow of bus routes Downtown and obtaining more corporate sponsorships. "The agency wasn't going in the direction I'd like it to go," Fitzgerald added. But the reason most widely cited by board members and county administration is an apparently strained relationship between Bland and state lawmakers. Letwin said that the primary reason the board terminated Bland was because he didn't lobby effectively enough for statewide transportation funding. "I don't think any of us have criticisms for Steve in his role as operating executive," Letwin told reporters Feb. 1. But "we have not had much success in getting a dedicated funding source." State Sen. Jay Costa doesn't fault Bland for that specifically, but local lawmakers did chafe at how Bland criticized them for not finding steady funding. Publicly, Bland often said that state politicians were the ones who had to act to find funding to preserve service. At a March 2011 board meeting, for example, Bland told angry protesters, "This problem lies in Harrisburg, not in Pittsburgh." "It wasn't [Bland's] role to deliver [a solution]. However it was clearly his role to maintain the relationships and set the table for a positive outcome," says Costa, senate Democratic leader. Meanwhile, Costa says, local legislators were lobbying then-Gov. Ed Rendell to flex funds to the agency to avert devastating service reductions. In 2010, for example, Rendell flexed nearly $45 million to the agency, enabling it to avert the worst of a planned 35 percent service cut. "Nobody else [got flex funding]. Colleagues around the state, especially in Philadelphia, said, ‘What the hell is going on here?'" says Costa. "It's frustrating. We're working ... to bring home large chunks of money and still getting blamed." Costa said that lawmakers were also shut out from offering input on route changes and other day-to-day operations that affect constituents. "It was sort of like a closed shop as to what they did, but when it came to find fault, they laid at the doorstep of the legislators," Costa says. "There does need to be a little diplomacy, if you will, or political acumen that goes with the position," Fitzgerald said. Transit advocates say that it's hard to gauge Bland's performance at the state level. "There's not a director out there who does not walk the halls of Harrisburg," says Chris Sandvig, regional policy director for the Pittsburgh Community Reinvestment Group. "It's important when you're in a funding crisis that you're educating lawmakers about what the real issues are. I also think you need a community behind you." Sandvig praised Bland's accessibility to community groups, and said that the transit-advocacy movement grew "arguably more robust than it's ever been." But he adds that there is a political dimension to the job of running a transit agency. "Anybody that thinks just being a good administrator or just being there for the good of the order is enough to carry you ... [is] deluding themselves," Sandvig says. "You've got to be a politician." Bland isn't the first authority head to be cut by Fitzgerald's axe. Fitzgerald also engineered the firing of long-time Department of Health head Bruce Dixon. Fitzgerald maintains such maneuvers are needed to put in place key leaders who can guide the county. And political observers say it's in Fitzgerald's purview to appoint people who are in line with his agenda. "There has to be some agreement" between the board appointees and the county executive, says Gerald Shuster, a political-communications professor at the University of Pittsburgh. And an executive has to exercise that authority on the front end because, "By law, these authorities are independents and [appointees] can thumb their noses at him as long as their term." But maybe not entirely. Fitzgerald says he asks board and authority members to sign undated letters of resignation, which would allow him to remove a board member whenever he wishes. He says no board member has stepped down or been removed as a result, and that he has "disagreements all the time" with members. Authorities were created to issue debt that finances new projects, and they can have other governmental powers like eminent domain, says Moe Coleman, a professor and former director of the University of Pittsburgh's Institute of Politics. And while their boards are supposed to be semi-independent, "Executive leaders have always had some leadership responsibility," he says. Mayor David L. Lawrence, Coleman notes, chaired the Urban Redevelopment Authority, while Mayor Tom Murphy chaired the Housing Authority. Still, Coleman says, Fitzgerald has had an "aggressive" approach. Demanding that appointees give him unsigned resignation letters "is powerful stuff" that treats an authority as if it were a "line agency" or county department. And those moves could damage efforts to attract top-flight candidates to head the agencies, Coleman warns. "You need to run these organizations [with] highly skilled professionals," he says. "If they think they'll be second-guessed by political considerations ... recruitment becomes an issue."